This beautiful modern four/five bedroom detached family residence standing on circa 0.5 acre site is currently available with O'Donnellan & Joyce. The property is located approximately five miles from Moycullen village and within easy commuting distance of both Moycullen and Galway city. This property would be an excellent family home as it has an abundance of space internally and externally with a top class finish throughout. The ground floor has an open plan living area, utility room, and double bedroom with Jack & Jill main bathroom. There is another room on the ground floor which is currently used as a bedroom but provides the option for use as a study. On the first floor there are three large bedrooms with the master bedroom containing a spacious walk-in wardrobe. The most attractive feature of this property is its energy efficiency and the high level of insulation used throughout. The property is heated by an underfloor heating system along with thermodynamic solar panels to heat all the hot water. The property contains a 600sq ft detached garage to the rear which has potential for conversion to separate living quarters. The location of this property is superb, within walking distance of the local shop, Tullykyne National School, and an equestrian centre. The popular village of Moycullen is located close by and has lots to offer in terms of schools, playground, supermarket, and dining facilities such as the well-known White Gables. The location of this lovely property makes it ideal for access to Galway city, NUIG, and UHG, being only 20 minutes away. It is also located at the Gateway to Connemara, via Oughterard and Maam Cross. 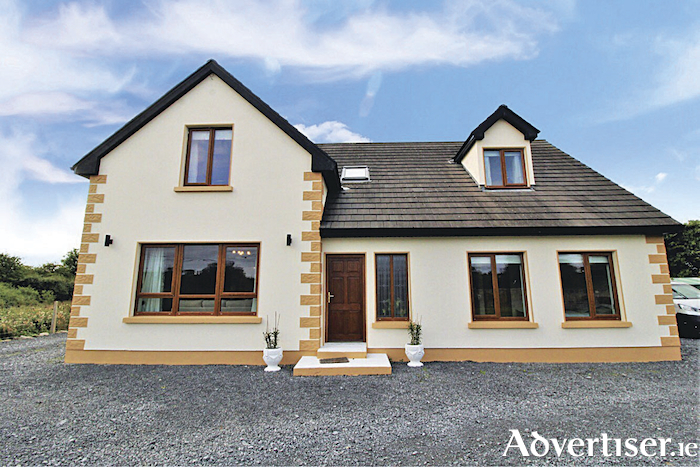 It is also an ideal location for any fishing enthusiasts with access to Lough Corrib not far away. The property offers huge potential to extend with provisions in place to extend the kitchen to provide a sunroom for extra living space. Externally there are large gardens both front and rear which can be enhanced further with additional planting and there is enough space for your own vegetable patch if desired. This is perfect for anyone looking for a modern, energy efficient, family home with space in abundance. Viewing is highly recommended and is guaranteed not to disappoint. AMV is €385,000. Viewing by appointment. For more information contact Mary Fahy on (091 ) 564212.